The Sciton SKINTYTE™ treatment is based on the principle of selective thermolysis – it uses Sciton’s BBL™ (broad band light) technology to deeply heat the skin while cooling and protecting the entire treated surface. The procedure is quick and comfortable with no downtime, and results in firmer, more youthful-looking skin. The SkinTyte procedure utilizes a broad band of light energy to deeply heat dermal collagen. This promotes contraction of the collagen and helps create a renewed collagen foundation leading to firmer skin. Powerful cooling protects the outer surface of your skin making this a very safe and comfortable procedure. A series of 5 treatments every two to four weeks is typical of most clients. 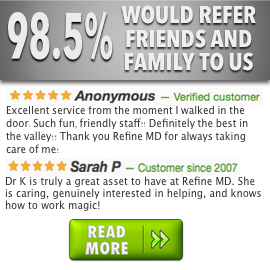 Your Refine MD consultant will personalize your plan based on your goals, and may also combine SkinTyte with other procedures to optimize your results.